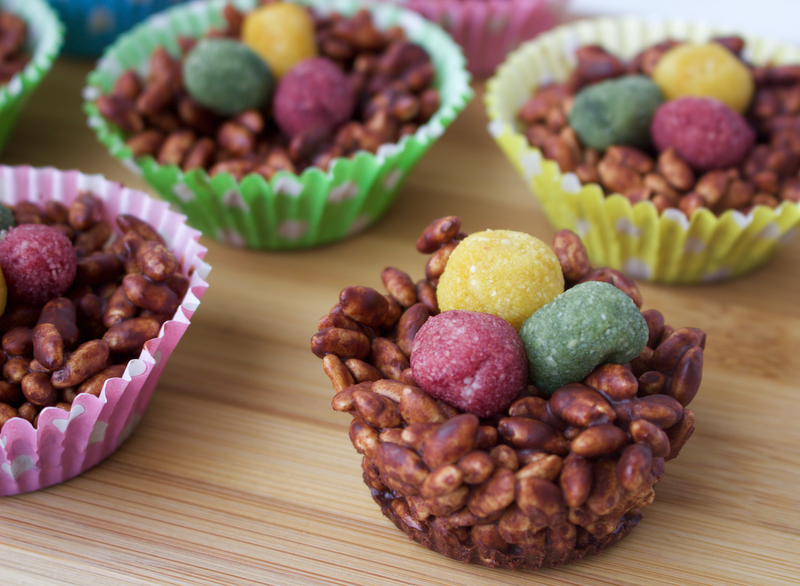 I used to love making chocolate rice krispy cakes when I was little! Melted the chocolate and stirring in the rice krispy's was so much fun, and of course I always ate some straight out the bowl before they were set in the fridge! 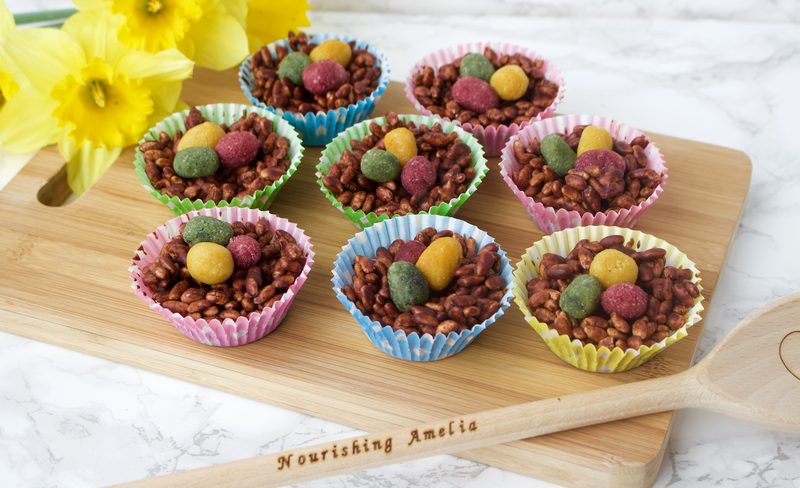 They're such a classic treat - great to make with kids and everyone loves them, so this Easter I decided to make a healthy chocolate rice krispy cake alternative that's just not (if not more) delicious, complete with marzipan mini eggs! 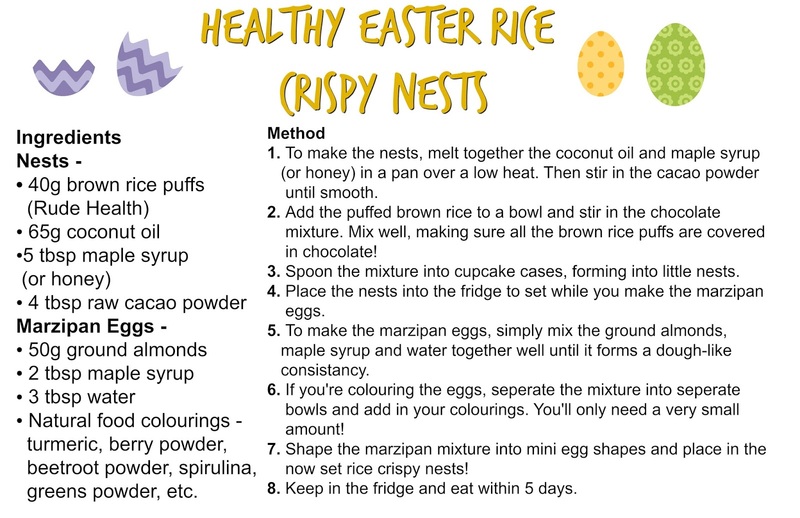 These healthy easter rice crispy nests are super easy and fun to make, they look seriously cute and both kids and adults are going to love them. They're 100% vegan, gluten free and refined sugar free but also 100% scrumptious and sweet! I don't hate gluten or dairy and try to keep my refined sugar intake as minimal as possible, so instead of using Rice Krispies in this recipe I used Brown Rice Puffs from Rude Health, which are basically like the healthy, unrefined version of Rice Krispies and available to buy from most supermarkets in the 'free from' aisle. For the chocolatey goodness I simply melted together cacao powder (my favourite is Sevenhills), coconut oil and a pure maple syrup to create a wonderfully rich, sweet and mouth-wateringly delicious chocolate liquid that sets hard in the fridge. I know you're wondering how I made the healthy marzipan eggs. Well, they're simply ground almonds and maple syrup! I've used beetroot powder, turmeric and greens powder to give them some colour but you could use things like berry powder, hemp powder, spirulina or any other natural food colouring you have - or you can just keep them simply plain!